Last week we got a fresh coat of paint on the downstairs walls (another excellent job by our go to builder: Odd's N' Ed's), and ever since they finished I've been counting down to the first scuff mark we'd get on the wall. Actually, I was doing more than counting down: I was preparing! 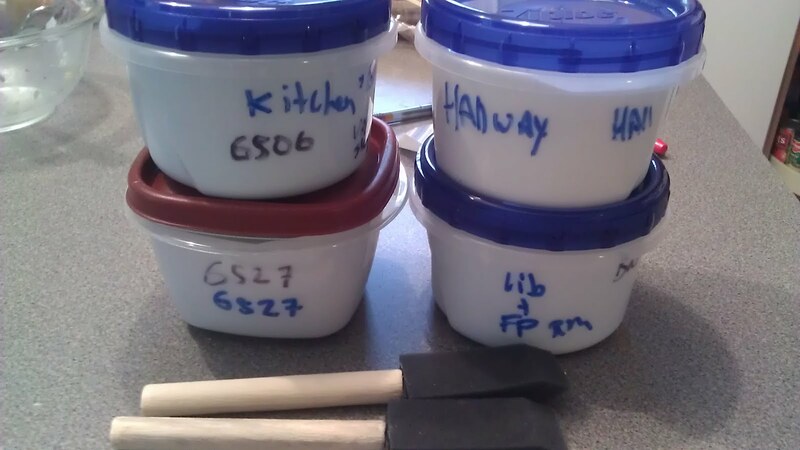 Today I made a Touch Up Kit - nothing fancy, just some well labeled Tupperware containers with each type of paint that was used. I cleared out a spot in one of our kitchen cabinets to store them, and made sure there were a couple of foam brushes stored along with the paint. Sure enough, as I was preparing this setup, I noted our very first scuff mark. I was also able to quickly identify the right paint and do a quick touch up. It was a thing of beauty. No more promising Shira that I'll get around to doing the touch up work, which of course I won't, because who has the time to wade through the random, unmarked paint buckets in the basement. Oh, I should warn you: this may in fact be a terrible idea. 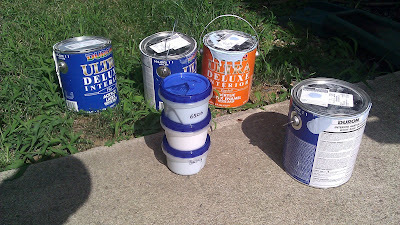 Maybe Tupperware is the worst place to store paint. I haven't found anything to suggest that yet, but what the heck do I know. I just know I want to make touch ups fast and easy. 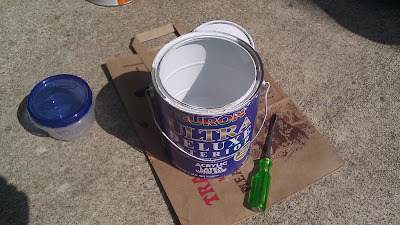 Actually storing touch-up paint in plastic tubs is commonly recommended. You just shouldn't use them for food in the future. Also since Tupperware closes air-tight, you shouldn't have to worry about it drying out our pair fumes smelling the place up. Here's a tip that was passed to me. Save your paint stirrers, complete with the paint on them. Write down the paint brand and code on them. Drill a while and thread them together. Hang them on a coat hangar in a closet somewhere you can easily find. Luther - thanks for the excellent idea!